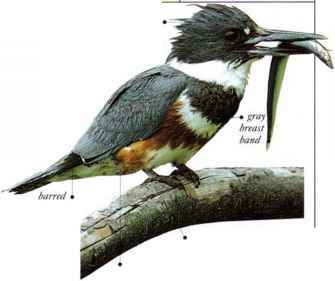 Spectacular tufts of plumes on either flank of the male help to identify this rain forest bird. In contrast with males of most other bird-of-paradi.se species, he does not display alone but with other males. Groups of males gather on bare branches high in the forest trees, to call and arch their plumes invitingly, advertising their presence with loud, staccato notes. Females visit displaying males to mate. After mating, the female nests and rears the young alone. Mature males arc solitary, while females and young males forage in small groups. Both sexes feed on fruit and insects. • NliST A cup of twigs, tendrils, and leaves, in a small tree. • DISTRIBUTION N.W. 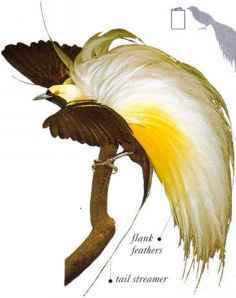 New Guinea; the islands of Misool and Yapcn; and along N. New Guinea extending as far west as Huon Peninsula • UliMARK The male's tail streamers account for the length difference between the sexes.